At Wonkblog, Lydia DePillis reports on the lack of a turn towards protectionism on the part of high-income countries during the global slump of the last few years. The evidence she cites suggests that developing countries have raised trade barriers, but in a fairly muted fashion. That's a huge improvement over the 1930s which saw widespread increases in trade barriers (including US' infamous Smoot-Hawley tariff). Though the increases in tariffs and other trade barriers did not cause the depression, most of us economists regard them as a counter-productive response. So, why did the United States appear to be less aggressive about protecting itself in the face of the latest economic meltdown? It's learned from experience. "We designed the current system in response to what happened in the 1930s," says Chad Bown, a World Bank economist who maintains the database of temporary trade barriers. For one thing, the United States is able to target products more specifically rather than entire sectors. "That helps blow off some political steam and not have overall increases in protection," Bown says. Another important factor may be that now, unlike the 1930s, the world is largely operating under a (non) system of floating currencies. In Trade Policy Disaster, Doug Irwin argues (persuasively, I think) that the motivation for the increasing trade barriers was more "mercantilist" than "protectionist" - that governments were concerned with preventing trade deficits, which would have led to deflationary gold outflows under the gold standard. Today's countries aren't bound the same way. The one exception is Europe, where the economies of "peripheral" Europe are the hardest-suffering in the world - they can't adjust through depreciation, and the EU prevents Spain and Greece from raising tariffs. Update: At VoxEU, Chad Bown discusses some findings from the Temporary Trade Barriers Database. 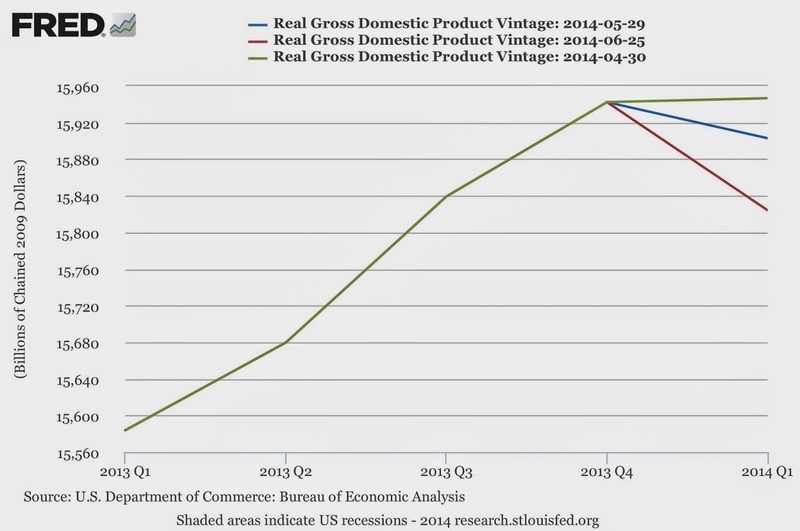 appears smaller than it did before -- the BEA's "third estimate" of real GDP growth came in at -2.9% annual rate. That's really bad, and a big revision from the "advance estimate" in April of 0.1% growth, and the "second estimate" in May of -1%. One of the things I emphasize to my students are the limitations of GDP statistics. One of the difficulties in using them is that they are subject to substantial revisions, that come in with considerable lags. Policymakers - and anyone else trying to judge the state of the economy - are looking at noisy, backward-looking data. Here it is, just past the summer solstice, that we learn that GDP last winter (Jan. - Mar.) was dropping at its fastest rate since 2009 (the first quarter of 2011 is only one other quarter since the recession with declining GDP). The rate of decline in the 1st quarter was worse than either of the two quarters with negative growth in the 2001 recession. Although there are usually some changes, this particular revision was unusually large - the change from the initial to the third estimate was the largest since the BEA began releasing estimates this way in the mid-1980's. The prevailing theory on why the first-quarter was so bad appears to be that it was mainly due to unusually severe weather; although the data are "seasonally adjusted" to account for the fact that some types of economic activity normally are lower in January and February - this winter may have been worse than most. As Neil Irwin and CEA Chair Jason Furman both note, other indicators - like employment - looked ok during the same period. Payroll growth averaged 190,000 during the first three months of the year. That, as Justin Wolfers explains, means a large deviation from the historic relationship between unemployment and output growth known as "Okun's Law". It also implies a big drop in productivity as we measure it. The Federal Reserve Board welcomed a Wesleyan alum today: Lael Brainard '83 was sworn in (she's second from right, along with Jerome Powell, Janet Yellen and Stanley Fisher). Brainard previously served as Undersecretary of the Treasury for International Affairs; the NY Times' Annie Lowrey wrote a brief profile of Brainard when she stepped down from that post last year. I think that in writing the General Theory, Keynes was viewing himself as a spokesman for a discredited profession. That’s why he doesn’t cite anyone but crazies like Hobson. He knows about Wicksell and all the “classics,” but he is at pains to disassociate his views from theirs, to overemphasize the differences. He’s writing in a situation where people are ready to throw in the towel on capitalism and liberal democracy and go with fascism or corporatism, protectionism, socialist planning. Keynes’s first objective is to say, “Look, there’s got to be a way to respond to depressions that’s consistent with capitalist democracy.” What he hits on is that the government should take some new responsibilities, but the responsibilities are for stabilizing overall spending flows. You don’t have to plan the economy in detail in order to meet this objective. And in that sense, I think for everybody in the postwar period—I’m talking about Keynesians and monetarists both—that’s the agreed-upon view: We should stabilize spending flows, and the question is really one of the details about how best to do it. Friedman’s approach involved slightly less government involvement than a Keynesian approach, but I say slightly. So I think this was a great political achievement. It gave us a lasting image of what we need economists for. I’ve been talking about the internal mainstream of economics, that’s what we researchers live on, but as a group we have to earn our living by helping people diagnose situations that arise and helping them understand what is going on and what we can do about it. That was Keynes’s whole life. He was a political activist from beginning to end. What he was concerned about when he wrote the General Theory was convincing people that there was a way to deal with the Depression that was forceful and effective but didn’t involve scrapping the capitalist system. Maybe we could have done it without him, but I’m glad we didn’t have to try. This is consistent with the "Neoclassical Synthesis" view that Keynes himself presaged in chapter 24 of the General Theory, which Brad DeLong discussed on his WCEG blog yesterday and Krugman commented on today (the quote from Lucas makes me wonder if perhaps Lucas and Krugman aren't quite as far apart as they think after all?). Keynes delivered an early version of “Economic Possibilities” as a lecture at a boys’ school in Hampshire. He was still at work revising and refining the essay when, in the fall of 1929, the stock market crashed. Some might have taken this as a bad sign; Keynes was undeterred. Though he quickly recognized the gravity of the situation—the crash, he wrote in early 1930, had produced a “slump which will take its place in history amongst the most acute ever experienced”—over the long run this would prove to be just a minor interruption in a much larger, more munificent trend. In the final version of “Economic Possibilities,” published in 1931, Keynes urged readers to look beyond this “temporary phase of maladjustment” and into the rosy beyond. According to Keynes, the nineteenth century had unleashed such a torrent of technological innovation—“electricity, petrol, steel, rubber, cotton, the chemical industries, automatic machinery and the methods of mass production”—that further growth was inevitable. The size of the global economy, he forecast, would increase sevenfold in the following century, and this, in concert with ever greater “technical improvements,” would usher in the fifteen-hour week. As Kolbert notes, Keynes' predictions about growth were pretty well on-target. He wrote: "I would predict that the standard of life in progressive countries one hundred years hence will be between four and eight times as high as it is to-day." That implies an annual growth rate between 1.39% and 2.08%. According to Maddison project data, UK real GDP per capita rose 4.37 fold between 1930 (when Keynes wrote) and 2010, which gives an annual growth rate of 1.84%. 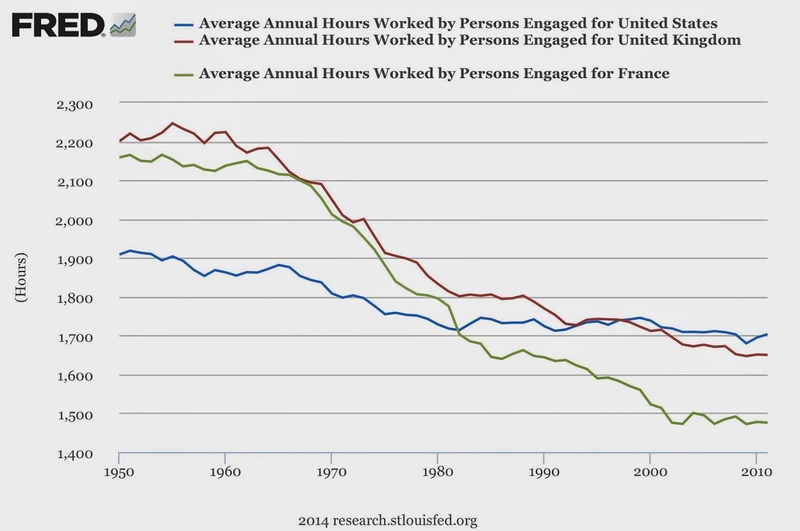 but even Western Europe is far short of "three hour shifts or a fifteen-hour week." That we're still working so much calls into question how we think about work, leisure and preferences. First of all, [James Surowiecki is] right that for what he calls knowledge workers — I’d just say elite workers in general — the whole time ethos has changed. When I was growing up on Long Island, there was a clear class hierarchy on commute times. Early trains were filled with menial workers; the later the train the more and fancier suits, with executives starting their day at 9:30 or 10. These days it is if anything reversed: lots of hard-driving suits on the early trains, much more mixed later on. So what is this about? Surowiecki emphasizes the incentives of employers, and their difficulty in taking the negative effects on productivity into account. My sense, however, is that the most important factor — which he alludes to but doesn’t put at the center — is signaling. Working insane hours is a sign of commitment, of willingness to sacrifice for the job; the personal destructiveness of the practice isn’t a bug, it’s a feature. One theory she entertains early on is that busyness has acquired social status. The busier you are the more important you seem; thus, people compete to be—or, at least, to appear to be—harried. A researcher she consults at the University of North Dakota, Ann Burnett, has collected five decades’ worth of holiday letters and found that they’ve come to dwell less and less on the blessings of the season and more and more on how jam-packed the previous year has been. Based on this archive, Burnett has concluded that keeping up with the Joneses now means trying to outschedule them. (In one recent letter, a mother boasts of schlepping her kids to so many activities that she drives “a hundred miles a day.”) “There’s a real ‘busier than thou’ attitude,” Burnett says. Phelps and Freeman are correct that our standard treatment of work (bad) versus leisure (good) often misses something important. This was present in the early "romantic" Marx, who said, "man is a tool-using animal". The relevance varies a great deal, I suspect - some of us have the good fortune not to feel "alienated" from our labor, though, for many, work is the drudgery that standard economic theory assumes it to be. A third explanation relates to the fact that "quality" is a relative concept and the desire for ever-higher quality goods keeps the consumption motive from slackening - this was explained well by Robert Frank in an NYT column.